Tons of restaurants serve grilled artichokes as an appetizer for good reason: they’re absolutely delicious! 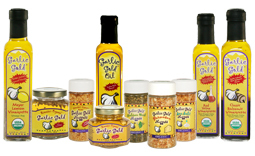 With our easy method, you can prepare them at home with a grill pan or on your outdoor grill. Either way, that charred flavor is impossible to beat. 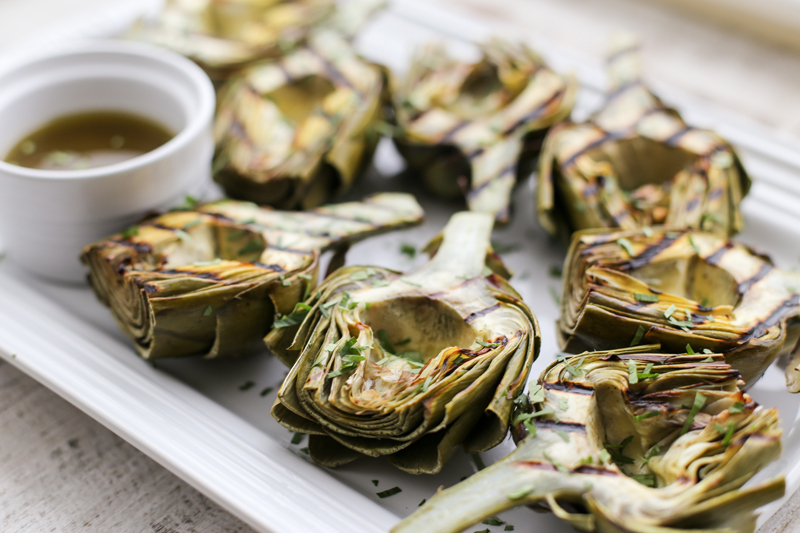 Just before grilling, we brush the artichokes with Garlic Gold® Meyer Lemon Vinaigrette. It adds amazing flavor and keeps them from sticking to the grill, so they turn out perfect every time. Once they’re hot off the grill, just serve the artichokes with more vinaigrette alongside for dipping! Prepare the artichokes. Use a sharp knife to trim off the brown ends of the artichoke stems and cut off the top two inches of the leaves. If desired, use a scissors to trim off the thorns from the remaining leaves. Steam the artichokes. In a steamer pot with at least one quart of water in the bottom, steam the artichokes for 20 minutes over high heat. Remove from the pot and set aside to cool for about ten minutes. Prepare the steamed artichokes for grilling. Slice the artichokes in half down the middle, then use a knife to cut out the inner choke and purple leaves. Scrape out any excess choke so the artichokes are nice and clean. Brush each artichoke half lightly with Meyer Lemon Vinaigrette on both sides. Grill the artichokes. On an outdoor grill or in a grill pan over medium heat, grill the artichokes cut side down for about four minutes, until they have well-charred grill marks. Serve the artichokes. With a pair of tongs, transfer the artichokes to a serving platter. Garnish with chopped parsley and serve with a bowl of Meyer Lemon Vinaigrette alongside.